Tough Love | Kevin Allison Presents: RISK! Live Show & Podcast! Oh, David Crabb this story was by far the most emotional one I’ve ever heard on Risk.. and I’ve heard a LOT! I sit here at work and type through red watery eyes, and continual goose bumps all through your story about Charlie. You are beyond lovely and are my favourite story teller ever. I’m sending you the biggest virtual hug. Charlie was lucky to have you. xo.. Different people grieve differently. At times, storytelling *is* a form of letting go. What you express in a story might commemorate what was, accept and honor the emotion you still feel, and show movement forward, in that something new is being created. For me, the RISK! story Kevin Goes to P-Town on Episode 227 was extremely cathartic to tell. I had just been through a painful experience, but I was making emotional sense of it by connecting with others and taking them back along with me on that journey to see what could be gleaned from it. I felt like I’d gotten over the hump of processing what had happened to me by sharing that story. A lot of storytellers have reported back to us about a similar feeling after being on the show, like Nancy Sullivan, who shared her story of surviving child molestation on Episode 303. But you can also see that sort of thing happening in books like The Year of Magical Thinking, that Joan Didion wrote after her husband died, or movies like Life Itself, a sort of eulogy for Roger Ebert, or songs like Idiot Wind by Bob Dylan about his divorce. I pray you start to heal and I know it sounds crazy but it will get better. I didn’t think it would for the first two months and now I can actually look at her picture without having an absolute breakdown. My prayers are with you. Take care David Crabb. I usually don’t comment, but I feel I have to now. We put our cat down a week ago. We all loved him so so much, but we didn’t have much money to spend on him. We made him as comfortable as we could, and I know we made the right choice, but it hurts. I quietly cried as he went, as my whole family held him. But since then I haven’t been able to cry. I miss him so much. He was so affectionate, like a dog, he would follow everyone around all the time, he was my family’s little shadow. And now there’s no one. I needed to hear this story. I have been sobbing for the past hour in a way I have so desperately needed. I’m rambling, but I just want to say thank you. Thank you for this story. Hey everyone. I just want to say thanks for your comments here. Recording this with Kevin was such a release, but I worried afterwards that it would just being some dude crying about his dog. Your notes and comments about this story making you feel connected or less alone have really moved me. I’m really thankful to Kevin for letting me come over to hang out with him and Donky to record this, and one day I hope Kevin releases the “directors cut” which includes Donky”s litter box scratching interrupting a particularity sad moment. Thanks for the laughs and levity, Donkz! A few people I know have told me that they couldn’t understand why I seemed so sad before they heard this, but that they do after listening. It’s been hard to talk about Charlie’s loss and I’ll be forever thankful to RISK! for giving me space and time to explain. One of most beautiful, and loving stories I’ve ever heard. I listened to the podcast while lying on my couch with my dogs and sobbed. Then I made my husband sit with us and listened to it all over again. Beautiful storytelling with honest emotion. Thank you for sharing such a heartbreakingly beautiful story. Absolutely loved this episode, definitely not one to listen to while driving but David’s story is an absolute must listen and I’d wadger one of the favorite stories from the Risk! family. Much love to David and his partner, thank you so much the window into a wonderful relationship! <3 Charlie! As someone who is the daughter of a veterinarian, current veterinary student, and who has loved and lost my own pets, I just wanted to thank you for sharing your story. Charlie was so lucky to have had parents who loved him so much, and I know he knew how much he was loved. I hope it was cathartic to be able to do this, but I also want to make sure you are aware that there are specialized resources for you to help develop skills to better cope with this loss. Veterinary social work is an emerging and necessary field, as people are having to make such complex, difficult decisions in times of deep crisis. My university has a licensed social worker who specializes in human-animal relationships on staff at the teaching hospital. I found some individuals and resources who might be able to help on the California Veterinary Medical Association page here (https://cvma.net/resources/pet-loss-support/pet-loss-support-groups/). This goes for everyone else commenting – please don’t hesitate to reach out. There are people who are there to listen and who understand how difficult it is to process this kind of grief. There are so many valuable lessons in your story that I hope to internalize and translate into my actions as a future practitioner. I entered this profession to not only alleviate the suffering of animals, but people too. Thank you so much for reminding me of this purpose. I wish you the best of luck on this journey, and I hope you find peace soon. Kristen, Thank you so much for your note and your concern. Please know that I’m feeling much better. I think some people hear this story who don’t necessarily tell stories themselves and think, “This must be the state he’s in at EVERY moment.” One thing I learned about storytelling early on (from Kevin Allison no less) is the value and necessity of “telling the story from the place it happened.” Meaning, to be effective and honest about something in your past, it requires digging into the moments and scenes that make up the story. It’s only in the last few months that I’ve really come to consider not only how important this is to an audience receiving your story, but for you (the teller) to actual develop or gain insight from telling your story. Over the last couple years I’ve mentored and coached people about storytelling who suffer from trauma. And as painful as it is in the moment, its important to dig into specific memories to get anything out of it. That’s what Kevin Allison allowed me to do here. It was only only a matter of weeks after Charlie’s death. (It was three months yesterday. So I’ve now had quite a while to heal and reflect.) So please know that I’m doing so much better. I even attended a group therapy session for pet loss, that became a quite funny story about meeting several MAJOR dog lovers who believed their past pets were reincarnated children from past lives who now revisited them through electrical appliances. See… COMEDY! It was quite something. Anyways, thanks for all of these suggestions and reference links. 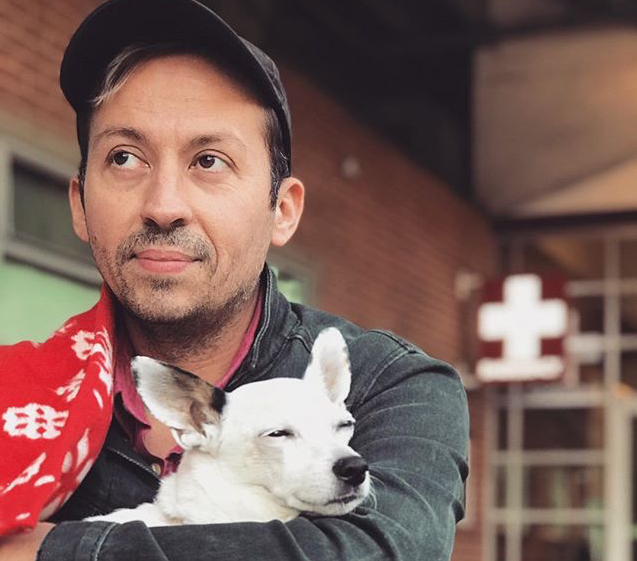 With more time I could’ve said quite a lot about the brave and kind people at the Animal Cancer Center who held me and Jack’s hands through this grueling process. I have so much admiration for people in your field and thank you from the bottom of my heart for the work you and your dad/mom do. Take care. I’m really sorry about Charlie, David. I think we can all relate to that story of loss and grief. Thank you for sharing. I woud like to give a little bit of money to help pay for your vet bill. Is there a page where people moved by your story can make a donation? Sophie, great idea! I would gladly donate to the vet bill. David/Kevin, please let us know if that is possible! This is the most beautiful and moving love story I’ve ever heard. The love bond you create with a dog is very unique and perfect, and that’s why it’s so difficult when they leave us. I wish we humans were more like dogs, all they have in their hearts is love and innocence. I have to admit that I love more dogs than people. Sending you guys all my love and thanks for sharing this beautiful story with us.